This brush turkey has been wandering around the inner west of Sydney all on his own, and has now built a nest in a tiny pocket of bush regeneration. It doesn't look good for a girl friend right now, unfortunately! I understand Brush Turkeys are reclaiming areas which once were theirs, partly because Sydney people are planting shrubby habitats rather than open lawn. I’m curious about why some people are replacing their lawns with more natural gardens. Is this because they’re now aware that they live in Australia? Or is it now time to participate in a new style of garden because the gardening magazines say they should? Or are some people genuinely trying to restore natural habitats? I haven’t noticed such a gardening trend in South Australia where Europhiles seem to hold firm sway in the garden. NIce find and nice shot. Thanks for your thoughts, Whistling Duck. I had wondered if water restrictions are a factor in people replacing their lawns with less water hungry gardens. It would be great if, in planning drought resistant gardens, people planted indigenous vegetation. To have Brush Turkeys building mounds in front gardens might eventually create an increase in those property values! Fortuitously, I happened to have the radio on RN this morning & caught Richards Fidler’s replay of an interview with Brisbane urban ecologist Professor Darryl Jones. Among other things Darryl talked about Brush Turkeys & their comeback to suburban Brisbane & their spread down the east coast to as far south as suburban Sydney. One thing that struck me in listening to the interview was that we talk about how Brush Turkeys are “invading the suburbs”. In fact, it is we humans who have invaded Brush Turkey country. The Brush Turkeys are merely reclaiming territory which once was theirs & to say that they’re invading suburbs is imperialistic human hubris at its best. Darryl ascribed the spread of Brush Turkeys largely to protection measures which were introduced in the 1970s following turkey massacres over a long period of time. Numbers have slowly recovered since these measures were introduced. Apparently, Brisbane folk are much more tolerant of Brush Turkeys than Sydney folk, the latter seeing them as a nuisance. 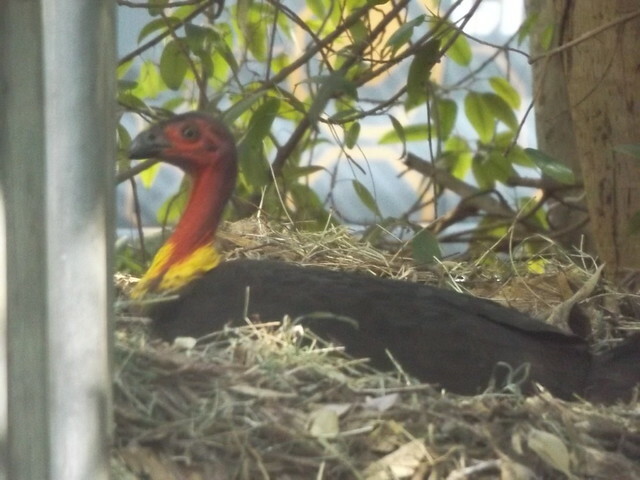 From my reading of a number of reports on Brush Turkey recovery there are indications that some humans, now traditionally isolated from nature by their city lifestyles & who are intrigued by these birds which they know little about, are prepared to tolerate them & treat them as a welcome curiosity in their gardens. With natural things becoming increasingly rare we might next see active encouragement of Brush Turkeys, even other wildlife, through the restoration of natural habitats in suburban gardens. Ill have to try and catch that talk off the podcast. Didnt realise they were on the march down the coast - assumed they had always been around. Apparently, Brisbane folk are much more tolerant of Brush Turkeys than Sydney folk, the latter seeing them as a nuisance. Wonder if he has any measurable data to back this up or is just surmising. As you suggest I think many people are quite intrigued by the appearance of a brush turkey in their garden ... whether they be in QLD or NSW. They are an amazing bird. How they manage to avoid cats, dogs and foxes is incredible for a ground dwelling species. Hi Whistling Duck. If I recall rightly, Professor Jones inferred that Brisbane folk are considerably more used to having Brush Turkeys around than Sydney folk who have only recently encountered them. Lack of familiarity may mean that Sydney people see Brush Turkeys as something of a threat either to themselves or to their gardens. Maxhr, I would think that young Brush Turkeys in suburbia are very vulnerable to cats (& maybe dogs, too) because I understand that they’re virtually left to fend for themselves as soon as they struggle to the surface of the mound having broken out of their eggs.